I have decided that Wednesdays are a good day for my weekly post, “Cheap and Chic of the Week.” Every week I will scour the web, and the stores, for the one thing that I think deserves the title, “Cheap and Chic of the Week.” For my inaugural post, I want to talk about zebra. If the infiltration of Osa Johnson’s I Married Adventure into every designer living room isn’t enough of an indication, zebra has been quite the craze. Although I’m sure there are those critics out there who feel that zebra is “over,” I say that a little zebra can always go a long way! 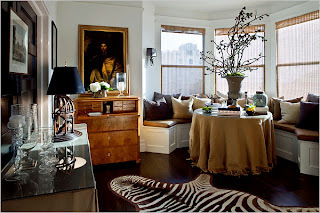 Now I am not advocating that one “deck the halls” with zebra, cheetah, and leopard; but just a small hit of zebra in any room can exclaim, “I’m into adventure!”–and give that room the edge that it was looking for. This week, the “Cheap and Chic of the Week” is at Urban Outfitters. 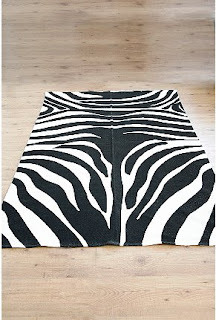 It is a small, cotton, 5×7 zebra rug, at a cost of only $68! This is definitely a worthwhile purchase, which will add a hit of adventure to any room–big or small. About a year ago, I purchased a similar throw rug from Urban Outfitters, and it was a staple of my apartment in NYC under a CB2 lucite coffee table, and has become the focal point for my tiny Philadelphia studio. I purchased a brown and white 3 x 5 version for $11 (! )–and I am still kicking myself that I didn’t buy them for friends, neighbors, relatives, strangers and a few extra for myself. Grant Gibson‘s San Fransisco Apartment … Rental! Oh my gosh your studio is killer! 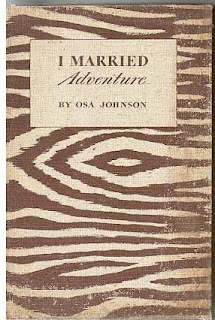 Great post, and I absolutely HAVE to find my own copy of “I married Adventure”. I’m thinking it will look really nice stacked next to my turquoise foo dogs!